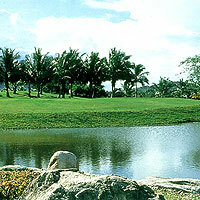 The first of the new courses to open in 1991, Palm Hills is the closest to Hua Hin. It was the main venue for the inaugural Thailand World Pro Am tournament in 1993 and the Max Wexler design blends with the natural terrain of the surrounding hills to provide a layout which is enjoyable to golfers of all standards. Water hazards feature at regular intervals. Thousands of brightly coloured bourganvilleas add to the natural beauty and the back nine provides some tremendous views of the Gulf of Thailand. The greens can be fast with some very tricky borrows.